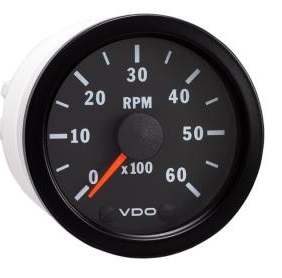 The rev counter fitted was a VDO Cockpit Vision 52mm 6000RPM tacho. This fits straight into the original instrument pack (VDO is the manufacturer of the original Land Rover instruments). The rev-counter is supplied as a complete kit – this comprises of the calibrated 52mm 6000 RPM rev counter, green illumination, screw ring, ECU pin and fitting instructions. The cost being £49.99 plus delivery (July 2004). It is a universal unit and will also work with all other Land Rover vehicles. The units will calibrate with either petrol (pulse) output or diesel – using the “W” terminal from the alternator (one of the three windings before they enter the regulating circuit). According to the workshop manual the alternator is a Magnetti Marelli A127-100amp. The W terminal (in the photo identified with “?”) is a small nut and bolt with a push on plastic cover. The tacho needs configuring to the alternator so it displays the correct engine rpm. This is affected by different alternator types and pully sizes. The signal wire is connected to the “W” terminal on the alternator. Then, with the engine up to normal operating temperature, the unit is configured to your engine using the three dip switches on the back of the tacho. 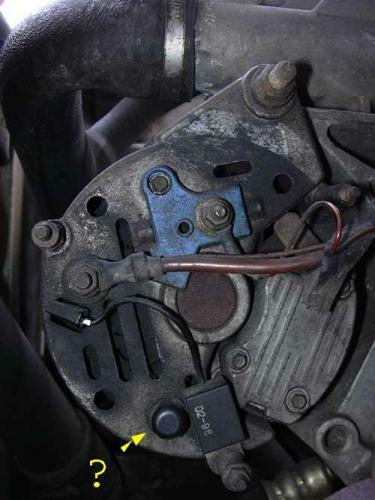 The recommended method is by using a strobe light on the crankshaft pulley to set the engine to 1000rpm, then try the 3 dip switch combinations to find the one which gives the closest reading to 1000rpm and do a final adjustment to the exact figure using the small adjusting screw on the side of the tacho. I didn’t have the strobe light so adjusted the tacho to approx 750rpm with the engine idling. I know it is about right as the tacho peaks at around 4500rpm.